Check-in for United is in Zone D of Terminal 2 at Heathrow, and this is easily found with the airport way-finding. It is important to note that for flights from Heathrow, passengers cannot obtain their boarding pass using online check-in unless this is done via the United app which is an inconvenience for those less technologically savvy. The self-check-in units are quite easy-to-use, and staff are available to assist. Service quality is unfortunately disappointing due to the impatient, passive-aggressive responses for simple visa and baggage related enquiries – not a good start. Boarding is conducted in an organised zonal format which works efficiently. As the flight is relatively quiet, it is almost complete by the time I reach the gate. After a brief passport check, I self-scan my boarding pass to enter the airbridge. At the aircraft door, there is a single member of cabin staff standing with hands in her pockets. Aside from a cursory nod, there is no greeting at all, nor any direction or guidance to my seat – it is a poor first impression. In the cabin, service is mixed – 2 staff are observed, one is quite proactive and helpful with luggage storage and re-seating customers. The other is using a personal cell phone in the aisle, and this does seem somewhat unprofessional. Boeing 767-400 in Economy Class was at 30% capacity in the main cabin. For International flights, United Economy Class passengers are permitted 1 x 23kg checked luggage and 1 carry-on bag (22 cm x 35 cm x 56 cm), and there appears to be no upper weight limit. In addition, a small personal item such as laptop bag, briefcase or backpack is also allowed. 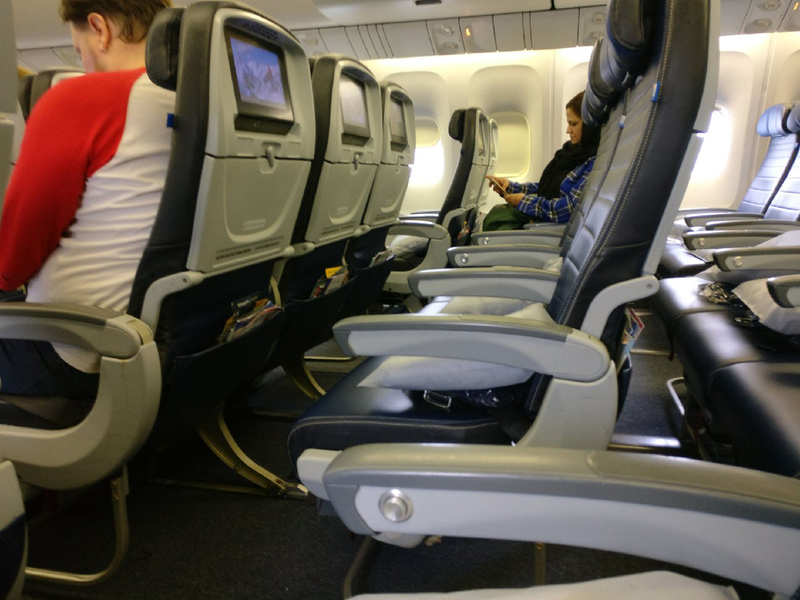 Economy Class seats are fitted out in soft navy leather with white stitching and royal blue leather adjustable headrest – there are no headrest covers. 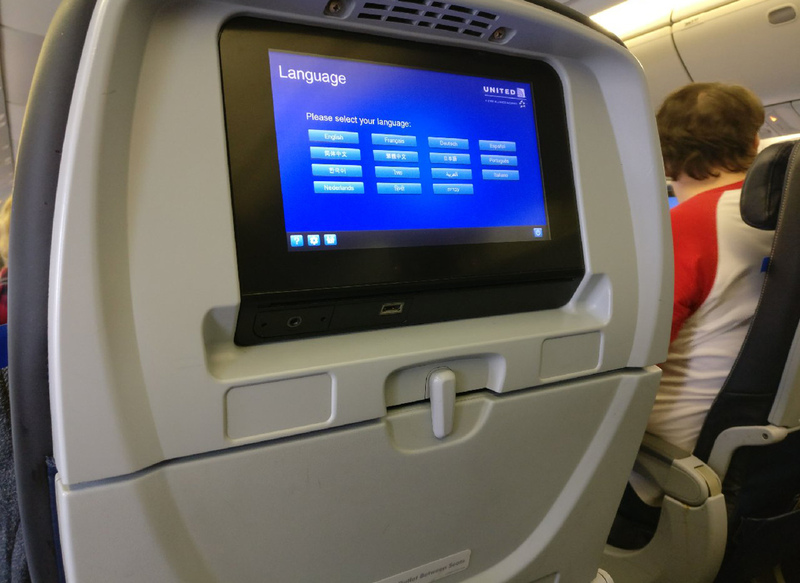 According to United.com the seat offers a 31-inch seat pitch and 18 to 18.5-inch width and is configured in a 2x3x2 layout which is industry standard. In window seat 40A, the space feels comfortable, and with no passenger in front, there is adequate space to have a 13-inch laptop open to work – however, this would not be the case if the forward-seat was reclined. Amenities include a 110v universal charge point for larger devices (1 per 2 window seats, 2 per 3 middle seats), a USB socket at each seat and a 10-inch widescreen configured PTV screen. There is a standard overhead reading light, but there are no personal air vents available. On boarding, the cabin is quite clean and well presented for carpets and seat covers. The main cabin panels are unmarked and rendered with a subtle grey motif. The tray table for my seat is marked on the rear, but the fold-out area is clean and in acceptable condition. The touchscreen PTVs seem to be an area that is overlooked during transit cleaning and are marked with fingerprints. The primary contact areas of the personal seat space are clean to a satisfactory standard, but the central space between the seats is very grubby with a build-up of crumbs and other food debris. Toilets are basically clean on the first inspection, but there is limescale around the sink fixtures and fittings. 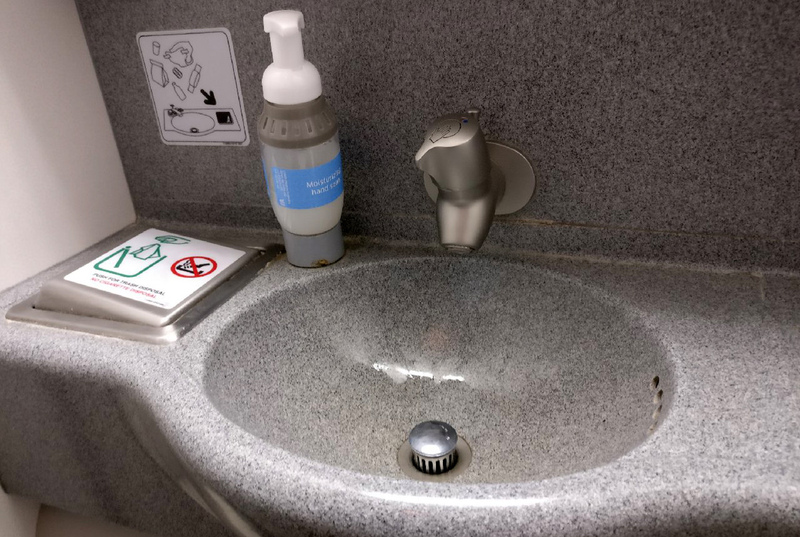 This B767 offers the older style mechanical water outlets (which, in fact, vary in style between the different washrooms), rather than the automated product found on the newer B787 and other such aircraft. During the flight, cleanliness is adequate, but amenities (hand towels, tissues and soap) run low, so I am sceptical as to whether the washrooms are checked with any regularity, if at all by the cabin staff. We left the departure gate on time at Heathrow, and after a long taxi, we departed 35 minutes later. Arrival into Newark was 5-minutes early, and we were at the gate exactly on-time. 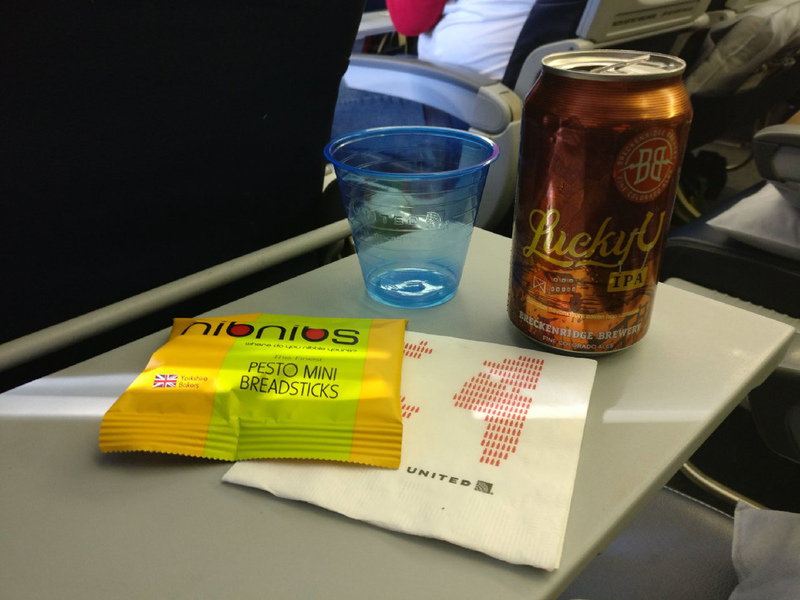 Inflight service begins promptly with a pre-meal drink and bar snack. United offers a choice of 3 beers, 2 wines (red and white), the usual soft drinks, juices and still and sparkling water. There is an extensive range of miniature spirits available to purchase for between $7.99 and $8.99. The bar snack is a small packet of pesto bread sticks, and the quality and flavour are okay. The main meal service follows shortly after and this offers a choice of 2 entrées (Thai chicken with rice and vegetables, and pasta with tomato sauce). Other meal tray items include a couscous salad, mini-baguette roll and butter. The cutlery pack has sachet salt and pepper. Cutlery is grey plastic and is robust and comfortable to use. I am quite pleased with the food quality across the meal tray. The couscous salad offers a pleasant lemon vinaigrette flavour and tastes fresh, and there is just a hint of spice to the Thai curry which means that it should suit a range of customer palates. I am sitting towards the rear of the cabin, and hot food temperatures are well-monitored. A second full bar service is provided with the meal tray, and for this quieter flight, staff are seen in the cabin clearing trays as customer finish the meal. 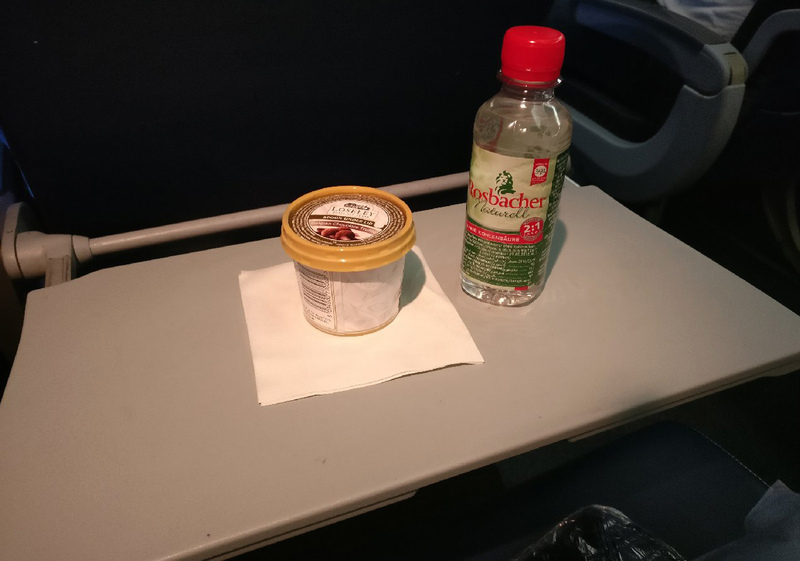 Dessert is an artisan tub of Belgian chocolate ice cream which is of excellent quality, and unlike some other airlines, this is served suitably thawed and ready to eat. A small bottle of chilled German branded mineral water is provided with dessert. A third full bar service follows dessert with tea and Illy branded coffee and fresh milk available – the coffee product is excellent. Throughout the meal, there are many clearances of trash and other service paraphernalia, and as such, customers are not too cluttered with items. Before arrival, there is hot sandwich service, and as the flight is quiet, staff provide hungry customers with a second sandwich which is pleasant. 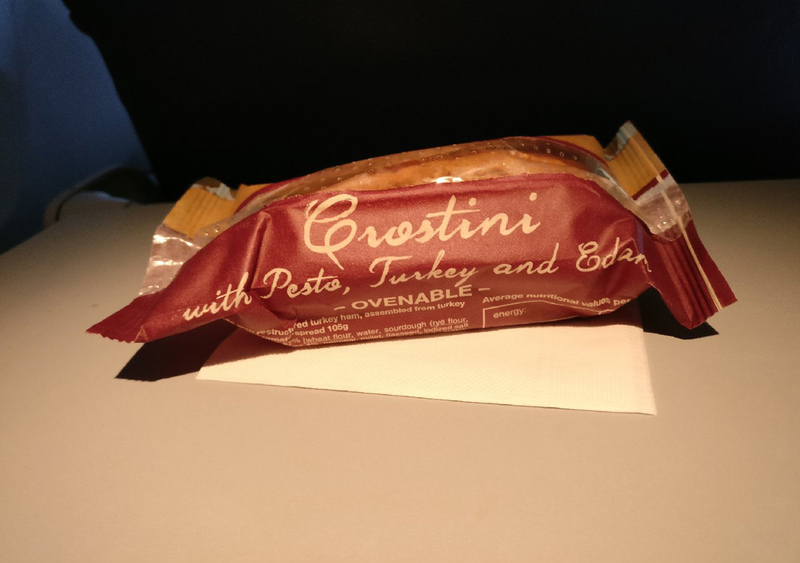 The turkey and cheese crostini is quite enjoyable (but looking down the list of ingredients – highly processed), but I am sure this is no worse than any high-street sandwich product! Soft drinks, tea and coffee, are provided with this second snack, and this is all satisfactory. United IFE selection is extensive across the range of movies, TV, podcasts and gaming options. Surprisingly, there is no CD album selection on the seatback IFE system. There are approximately 195 movie choices with 13 different language tracks and subtitles available. There are 40 original International films in 12 languages including Chinese, Italian, French, Hindi and Korean plus another 7 other options. For the primary user-interface, there are 15 different language translations available. There are the usual categories of comedy, action, thriller and suchlike, as well as more thematic content for Disney, DC Universe and Tribeca Film Festival. Within the individual groups, there are numerous films series such as Batman, Transformers, Spiderman amongst others. TV is extensive and covers a range of popular boxset choices and one-off documentaries across a range of categories – again, some of this is branded with names such as HBO, Showtime and Disney. Music is provided in the TV section with numerous Vevo registered video playlists from the 1980s to today – however, there does not appear to be any older music choices (60/70s, for example). In the seat pocket, there is a tatty, and dogeared inflight magazine called Hemispheres. I was somewhat surprised at the condition initially, but on checking the cover it was dated December 2017 (flight was mid-January), so evidently, this is not an item that is carefully monitored by ground maintenance. The actual content is quite impressive and offers some global scope with International destination coverage, Passenger information is quite exhaustive, and US customs guidance is available in 9 languages. There is a detailed buy-on-board guide in the magazine rear. WiFi Internet is available and works consistently during the flight for basic messaging and web-browsing. There is free access to United.com and IFE streaming. On this B767, there are 3 packages available $14.99 for 1-hour, $19.99 for 2-hours, or $29.99 for the entire flight. The costs are evidently above average, and it is disappointing that the $29.99 is package not usable on connecting flights. IFE streaming service is available to use with a range of personal devices (phones, tablets and laptops) and much of the content matches that provided on the central IFE system. There are a few additional movie and TV choices. The service operates a 2-tier system, with some content available directly over the WiFi, but most are only accessible via the United app. It is important to note that passengers must either download the app before the flight or purchase WiFi access to install the app after departure. The streaming service works on my tablet, but in my opinion, on aircraft with the integrated seatback product, if you forget to install the app, it is not worth paying for WiFi to access the service. 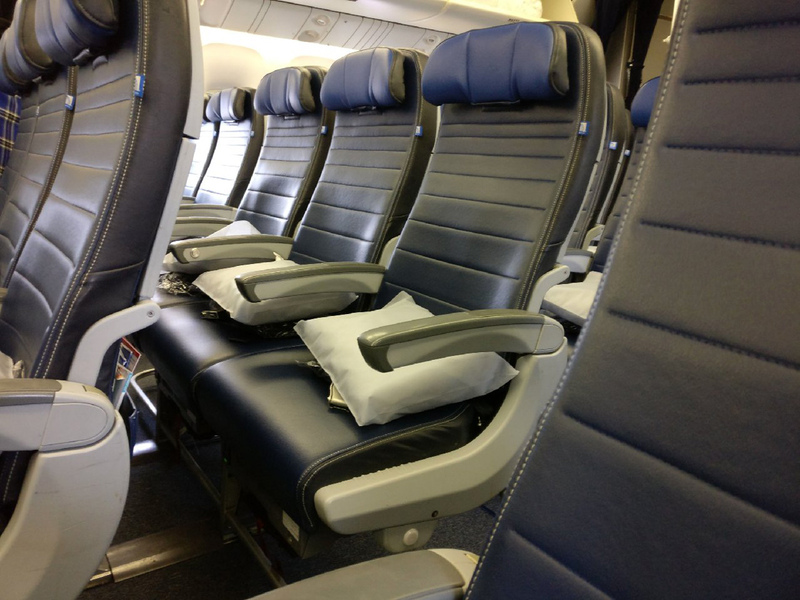 Pillows and blankets are available on each seat before boarding, and the quality is satisfactory. The pillow is presented with a soft, light-blue synthetic cover, and the blanket is in navy modacrylic. In my opinion, the blanket is warmer and more comfortable than some of the cheaper fleece material products which are now commonly provided. United does not give an amenity pack on this flight, and washrooms have a simple foamed hand wash.
As mentioned, aside from 1 proactive member of staff during boarding, the initial impression of cabin crew is somewhat disappointing. Inflight, the staff warm-up a little and for the meal and bar services there is little to fault regarding efficiency (but this is a quiet flight). Actual service delivery from a hospitality perspective is limited from most staff members. There is a single female member of the crew that appears to have some personality, and there is a degree of showcasing for the bar product, some conversation, and importantly, a smile during the service. Other staff, are in reality entirely monosyllabic and the customer must push for extra dialogue or meal information. There are no added value factors of service such as meal quality checks that some of the better Asian and Middle Eastern carriers will apply, which would push service quality higher with minimal additional effort from the staff (and no cost to the airline). The most discouraging factor is the neutral body language and facial expressions which are felt quite strongly during this flight. Mid-flight presence is a little better than one might expect, and bottled water is received several times between the first and second meals – however, staff remain in the rear galley for most of the flight. In the galley, staff are generally not attentive to customers. Out of interest, I went back twice during the trip and each time was greeted by one staff member playing a game on their phone, another reading and one that looked asleep. Flight deck crew are a little quiet during the journey, and this is quite unusual in my experience of US airlines which typically have some of the most chatty and interesting announcements. As there is some quite heavy turbulence across the Atlantic, it is felt that a reassuring word or two from the captain or first-officer would have been appreciated by the more nervous passengers onboard – mainly, as the bumpy air is quite persistent at times. Upon arrival at Newark, priority deplaning occurs but most Economy Class staff appear too distracted to say goodbye to passengers. As one moves through the aircraft, Business Class staff are somewhat more positive and chatty to customers as they leave the plane. Given the frequent references to “flying the friendly skies” during the pre-flight safety message, inflight magazine and many other aspects of United marketing, this is not embodied to any great extent by the cabin staff. There are snippets of positive service, but the overall feeling is that this is the exception, rather than the rule. The flight experience suggests that this is too reliant on individual cabin staff personality and motivation, rather than this being a defined and consistent element of company culture. For all of United’s claims on improvement in this area, the inconsistency suggests they have a long way to go. The product in many areas is very satisfactory, and in a practical sense, one cannot grumble about the seat, IFE and meal service. Yes, there is no hot towel service or personal amenities which some airlines provide on flights of a similar duration. 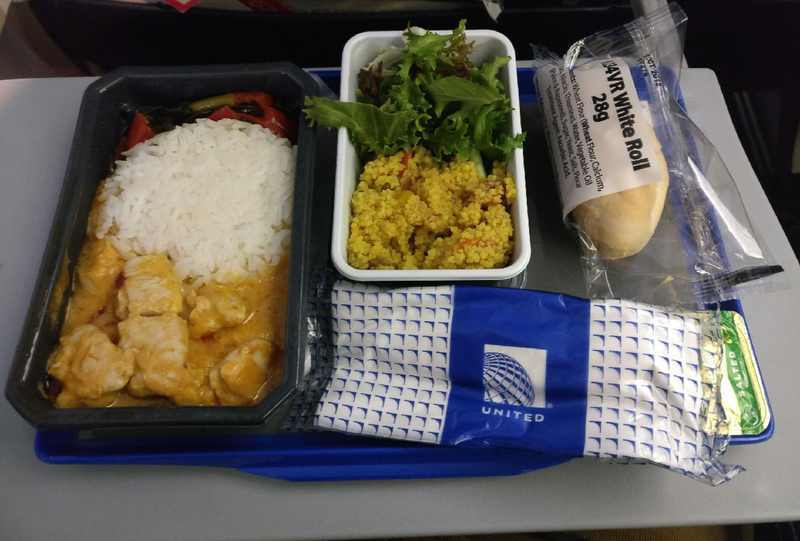 Similarly, having cheese and crackers, as well as a piece of chocolate on the meal tray would undoubtedly bring United standards closer to those offered by competitor airlines, but this is being quite critical. One cannot help but feel that the overall customer enjoyment of the flight would be so much better if the staff just smiled. The passenger load was light, it was a sociable lunchtime departure, and from my observations, there was limited use of call buttons or galley activity to disturb staff, so it is somewhat perplexing why most seemed less than happy.